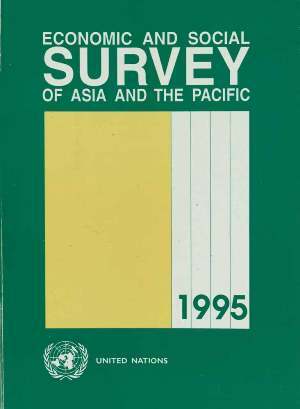 The Economic and Social Survey of Asia and the Pacific 1995 is the forty-eighth in the series of the annual Surveys prepared by the secretariat on economic and social development in the ESCAP region. Besides providing information on recent developments, the Survey analyses selected policy issues of current concern. Accordingly, this issue focuses upon the reform and liberalization of the financial sector as an important part of macroeconomic reforms, and social security as a policy tool for mitigating some of the social problems facing the region. The findings in this issue confirm the continuing strong economic growth in the developing ESCAP region which achieved an average rate of 7.7 per cent of GDP growth in 1994, compared with 7.2 per cent in 1993. Comparable rates of growth are also projected for 1995 and 1996. There has been a narrowing in the differential in economic performance among the diverse groups of economies in the region with improved accomplishments in South Asian as well as some of the least developed countries. Thus, while the average growth rate of both East and South-East Asian economies in 1994 increased only marginally, that of the South Asian economies registered an improvement by nearly a full percentage point. The performance of the least developed countries also improved by a similar magnitude. However, many of the least developed, small island and disadvantaged economies in transition are yet to establish a firm foundation for sustained growth with stability. The Central Asian republics are still experiencing overall output decline along with high rates of inflation, although the rate of decline has slowed in some cases. Economic reforms involving both the real and financial sectors are a continuing process. There has been an acceleration of such reforms over the past decade with the objectives, inter alia, of enhancing domestic systemic efficiency and improving international competitiveness. While recent policy reforms in individual countries are touched upon in the analysis of macroeconomic performance, the Survey especially focuses on the reform and liberalization of the financial sector. The measures implemented in this area aim at the reduction of barriers to entry into financial markets, deregulation of interest rates, reduction in or elimination of directed credit programmes, development of new financial instruments, liberalization of the external financial sector, and improvements in regulatory frameworks for more effective prudential management. The analysis points to the likelihood of efficiency gains resulting from the reforms as well as to the new policy challenges emerging from a more open financial sector. Particularly highlighted are the problems faced in maintaining domestic macroeconomic stability while sustaining openness to volatile international capital flows. Despite the rapid pace of economic growth, the region remains beset with many social problems. The Survey reviews social security provisions on such issues as financial security in old age, benefits for invalidity, employment injury, sickness, maternity, and medical care. The review indicates that social security coverage in the region remains rather limited. The beneficiaries are mostly those employed in the organized sectors while the poor and vulnerable segments of the population are largely excluded. Some of the problems and policy options for future expansion are also analysed. As in the past, the Survey is published on the sole responsibility of the ESCAP secretariat. The views expressed do not necessarily reflect those of the members and associate members of ESCAP.